1. Spin the two red valves to make the two white balls fall down. 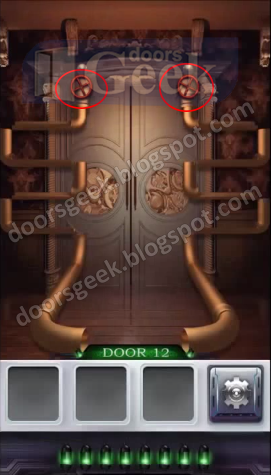 100 Doors 3 Level 12, Cheat, Solution for Android, iPhone, iPad, iPod. 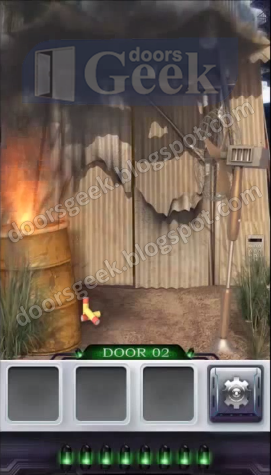 Note: This is "100 Doors 3 " by "MPI Games"
1. 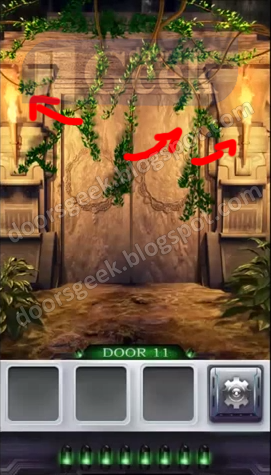 The solution of level 11 is to drag away the branches that are in front of the door. 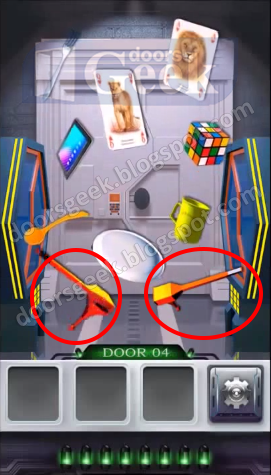 100 Doors 3 Level 11, Cheat, Solution for Android, iPhone, iPad, iPod. 1. Level 10 is quite simple. All you need to do is drag the green bubbles inside the green bottle, and the red bubbles inside the red bottle. 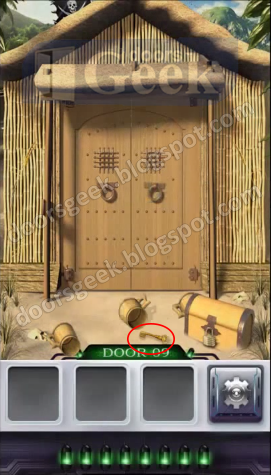 100 Doors 3 Level 10, Cheat, Solution for Android, iPhone, iPad, iPod. 1. Shake the phone and the 3 mugs will fall on the ground. 2. Inside the last mug you will find a golden key. 3. Use the golden key to open the chest, inside you will find a silver key. 4. Use the silver key to open the door. 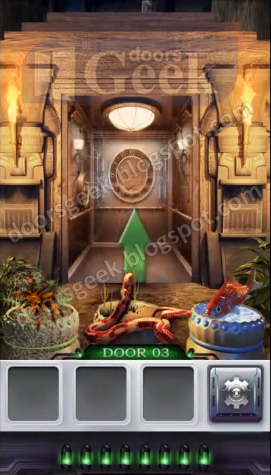 100 Doors 3 Level 9, Cheat, Solution for Android, iPhone, iPad, iPod. 1. 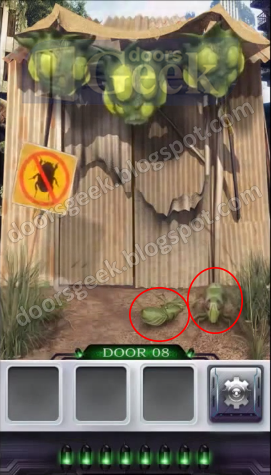 Shake the device to make the green bugs to fall on the ground. 2. Tap on the bugs to kill them. 3. Kill several bugs and the door opens. 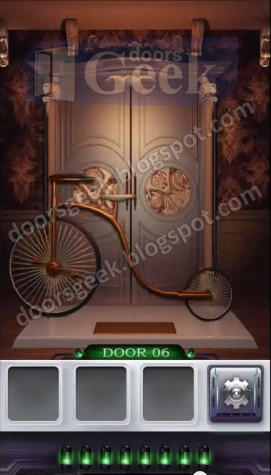 100 Doors 3 Level 8, Cheat, Solution for Android, iPhone, iPad, iPod. 1. Shake the device until the white stars fall of and reveal the code, above the door. 2. Tap the key panel and enter the code: "435916"
100 Doors 3 Level 7, Cheat, Solution for Android, iPhone, iPad, iPod. 1. In Level 6 you have to take the bike parts, and put them together to form a bike. 2. You can see in the second picture how the bike should look. 100 Doors 3 Level 6, Cheat, Solution for Android, iPhone, iPad, iPod. 1. 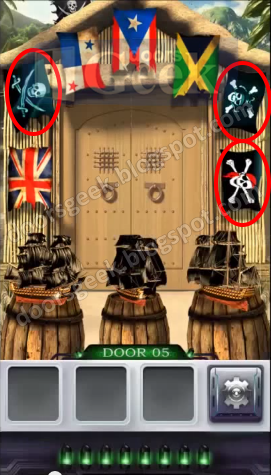 The 3 ships on the barrels are pirates ships, so you need to take only the pirates flags. 3rd - the one with red bandanna. 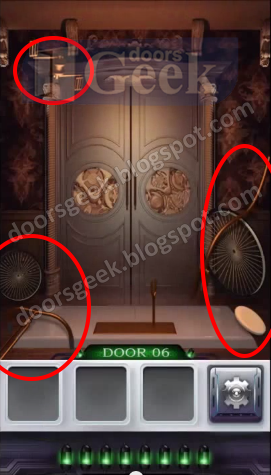 100 Doors 3 Level 5, Cheat, Solution for Android, iPhone, iPad, iPod. 1. Take the two orange levers that float around the bottom side. 2. 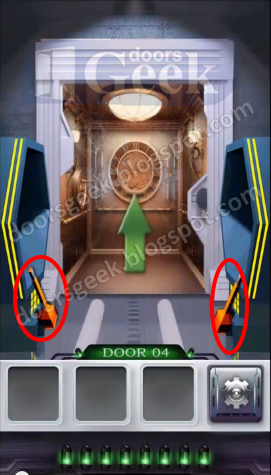 Now place the two levers on their slots, at the bottom part of the blue doors. 3. Now pull the orange levers and the door will open. 100 Doors 3 Level 4, Cheat, Solution for Android, iPhone, iPad, iPod. 1. Take the Spider, Fish and red Snake. 2. Place them on the barrels in this order: Spider - Snake - Fish. 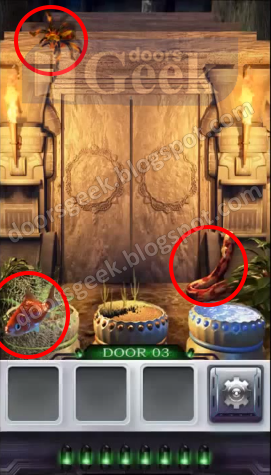 100 Doors 3 Level 3, Cheat, Solution for Android, iPhone, iPad, iPod. 1. Take the batteries that are on the ground, behind the barrel. Place them inside the fan. 2. Now the fan will blow the dust away and reveal the code: 5846. 3. 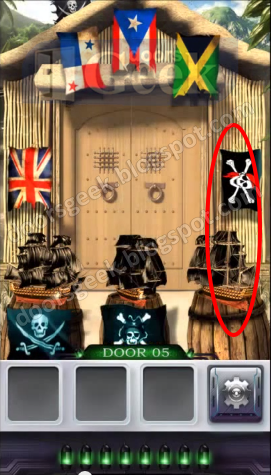 Tap the key panel in the lower right corner and enter the code (5846) to open the door. 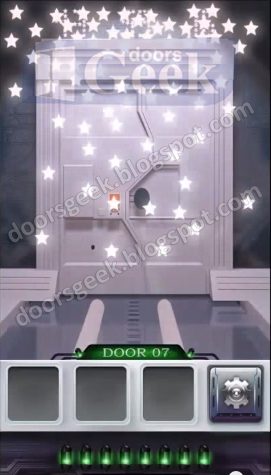 100 Doors 3 Level 2, Cheat, Solution for Android, iPhone, iPad, iPod. 1. 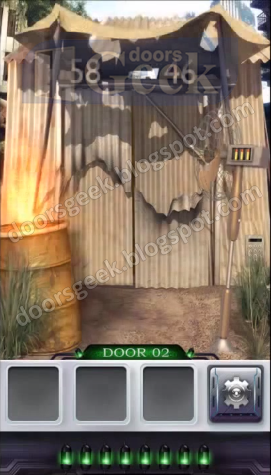 Tap on the three panel that are near the door, to activate them and open the door. 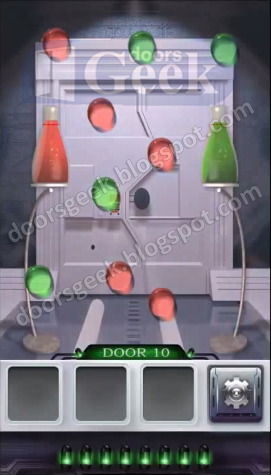 100 Doors 3 Level 1, Cheat, Solution for Android, iPhone, iPad, iPod.